It is July. The heat is rising. The fireflies are out in droves to the accompaniment of a cricket orchestra every night. Corn on the cob. Grills. The summer season has really begun. Click on the Book Giveaway tab to grab yourself what I would consider to be the perfect summer read-- Lady of Devices by Shelley Adina. The tenth novel in the series is due this fall so get started now. It is no secret that I am a massive Sanderson fan. A friend of mine recommended the "Mistborn" trilogy back in high school, and I have been reading ever since. When I first began the books, it was not apparent that all the different series and stand-alones he was producing would be connected. A decade later and readers have been informed by Sanderson that there is a bigger picture--Cosmere. It is all connected. The lands and magics. They all come from something larger than any individual series. That scope--that is amazing. He has written middle grade fiction, young adult fiction, fantasy, epic fantasy, and he even completed the "Wheel of Time" series. Now, he is trying his hands at graphic novels. It seems impossible that any reader could not be a fan of Sanderson. He has a format for anyone. 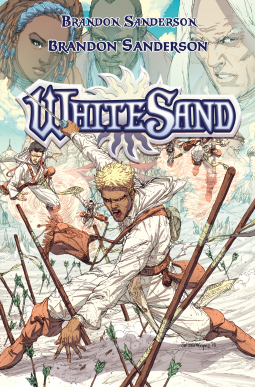 White Sand enters the graphic novel scene with a new set of characters plus some others previously introduced--but don't worry, you won't need to know any of it as all of his stories can stand alone despite their unity. I'll be honest; it is not my favorite of his endeavors. Sanderson builds a mighty picture. He is a man of words. Graphic novels just do not have the space for the kind of set up I expect out of Sanderson. BUT; I was very aware of this when I requested to read the Advanced Copy. The overall read was not disappointing. 5 stars for the layout, graphic style, color palette, and all that artsy stuff. The introduction of the characters and conspiracy were just a little crunched for me. For what is there, it is Sanderson level 100% and certainly worthy of 3 stars. Sanderson magic systems just hook you in with their depth and viability--sand mastery included. Total package is 3.5 stars and certainly on my recommended reading list. An absolute must for Brandon Sanderson fans.